Home/Equipment Reviews/Coffee Campside: What’s the Best Coffee Maker for Camping? Camping is an enriching hobby. But a lot of coffee fanatics allow themselves to be scared away from it out of fear of bleary-eyed, headache-contaminated withdrawal from their favorite hot caffeinated beverage. This fear is unnecessary. Not only are there currently ways to make coffee on a camping trip: these ways have always been there. From the traditional to the new, camping can allow us to make delicious cups of coffee while experiencing the natural beauty of the world around us. Boil Water - operated by rechargeable lithium battery, this machine can heat water up to 194℉/90℃ and coffee can reach 149℉/65℃. Espresso on the go - with compact and light-weighted design(1.9 lbs and 9.8" tall), it can be placed in your backpack. You can enjoy your own espresso when driving on the road, using your vehicle power supply to power it on. If there’s one class of coffee drinkers that have legitimately been left without high-quality brewing while camping, it’s espresso fanatics. The espresso is an intricate method usually made on massive machines. That means it’s nearly impossible to bring it to the camping experience. That being said, today’s technology offers new and incredible solutions. Most recently, there’s the CISN Portable Espresso Makers. Compatible with both Nespresso pods and ground coffee, it offers an automatic way to brew while on the go. This method is a good choice for short camping trips, but it isn’t perfect. For one thing, it is powered by a rechargeable battery. While that battery should last for a long time, it is possible to find yourself unable to brew on the go. In addition, it should come as no surprise that this method sacrifices the intricate power of the home espresso machine. While it is surprisingly strong, it won’t taste like a fully adequate replacement for your home machine. Given the price, that may mean some decide to go with a less expensive brewing method. This is an interesting and enjoyable way to make coffee on the go. And while it isn’t perfect, it will remain a part of the wilderness-loving barista’s repertoire. When people think of camping on the go, they usually think of some variation on the percolator. This is the simplest method of making coffee on the go: simply put your grounds in, put it on top of the fire, and wait to enjoy some strong coffee. While this is a reliable way to make great coffee on the go, it can also be divisive. Percolator coffee tends to have a strong and burnt taste, and can often come out a bit chewier than some home coffee-brewers like. That being said, this isn’t necessarily a bad thing. For one, Percolators are by far the cheapest method of brewing coffee. While that can come with some costs regarding the price of your coffee it also isn’t an unreasonable price to pay. On top of that, percolator coffee is a part of the camping experience for many. Given that and its low price, this is something you should try at least once, if only for sentimental value. The Aeropress has quickly become one of the most popular methods of brewing coffee on the planet. If you’ve ever used it, it’s easy to see why. The Aeropress works by making coffee in a tube placed on top of your coffee cup. The pressurized method of making coffee allows for a delicious brew to be made instantly. The method involves very little clean-up, and delivers a high-quality cup of coffee every time. There are many other ways to use the Aeropress. For instance, you can get a thick, french-press style cup of coffee by using the “inverted method,” which involves turning the press upside down balanced on the plunger and soaking grounds within it for 5 minutes before flipping it over and pressing. While everybody should try the Aeropress at least once, it can be difficult to recommend it specifically for camping. 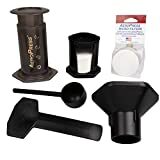 That’s because the Aeropress involves several parts, and it can be easy to knock those parts over while brewing outdoors. While this won’t be a problem for most, it can definitely pose a difficulty to those who have difficulty working with multiple parts at once. That being said, this is well-worth considering on your next camping journey. The french press is a unique case in the world of brewing while camping. It’s not often associated with camping trips, partially due to its somewhat involved cleaning process. That being said, as long as you’ll be able to find a somewhat flat surface on your trip, this is a great way to make a cup of coffee in nature. 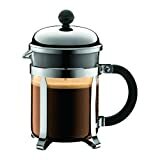 The Bodum is one of the best models of french press on the market. It’s reliably built and can consistently deliver well-bloomed and tasty coffee for a variety of mixes. However, it’s best to leave your French Press at home for multiple-day camping trips, given the difficulty of cleaning the device. On top of that, the need for coarsely ground coffee may necessitate grinding coffee before your trip, or bringing a portable grinder: either can be inconvenient. In spite of this, French Press coffee is delicious and should definitely be considered by serious outdoor Baristas. There are a variety of ways to make coffee on camping trips. While some may seem antiquated and lackluster, camping and brewing really can be two interests that go hand-in-hand. 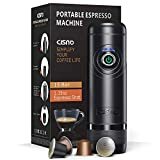 Newer methods like the CISN portable espresso maker can be interesting, but might not deliver the same experience or quality a manual and more traditional methods. That being said, brewing like camping, as with all forms of brewing, is primarily a matter of personal taste. So figure out what you like and enjoy your trip!